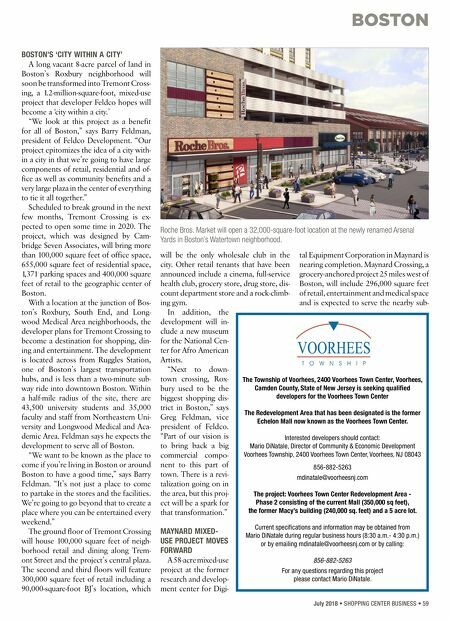 BOSTON July 2018 • SHOPPING CENTER BUSINESS • 59 BOSTON'S 'CITY WITHIN A CITY' A long vacant 8-acre parcel of land in Boston's Roxbury neighborhood will soon be transformed into Tremont Cross- ing, a 1.2-million-square-foot, mixed-use project that developer Feldco hopes will become a 'city within a city.' "We look at this project as a benefit for all of Boston," says Barry Feldman, president of Feldco Development. "Our project epitomizes the idea of a city with- in a city in that we're going to have large components of retail, residential and of- fice as well as community benefits and a very large plaza in the center of everything to tie it all together." Scheduled to break ground in the next few months, Tremont Crossing is ex- pected to open some time in 2020. The project, which was designed by Cam- bridge Seven Associates, will bring more than 100,000 square feet of office space, 655,000 square feet of residential space, 1,371 parking spaces and 400,000 square feet of retail to the geographic center of Boston. With a location at the junction of Bos- ton's Roxbury, South End, and Long- wood Medical Area neighborhoods, the developer plans for Tremont Crossing to become a destination for shopping, din- ing and entertainment. The development is located across from Ruggles Station, one of Boston's largest transportation hubs, and is less than a two-minute sub- way ride into downtown Boston. Within a half-mile radius of the site, there are 43,500 university students and 35,000 faculty and staff from Northeastern Uni- versity and Longwood Medical and Aca- demic Area. Feldman says he expects the development to serve all of Boston. "We want to be known as the place to come if you're living in Boston or around Boston to have a good time," says Barry Feldman. "It's not just a place to come to partake in the stores and the facilities. We're going to go beyond that to create a place where you can be entertained every weekend." The ground floor of Tremont Crossing will house 100,000 square feet of neigh- borhood retail and dining along Trem- ont Street and the project's central plaza. The second and third floors will feature 300,000 square feet of retail including a 90,000-square-foot BJ's location, which will be the only wholesale club in the city. Other retail tenants that have been announced include a cinema, full-service health club, grocery store, drug store, dis- count department store and a rock-climb- ing gym. In addition, the development will in- clude a new museum for the National Cen- ter for Afro American Artists. 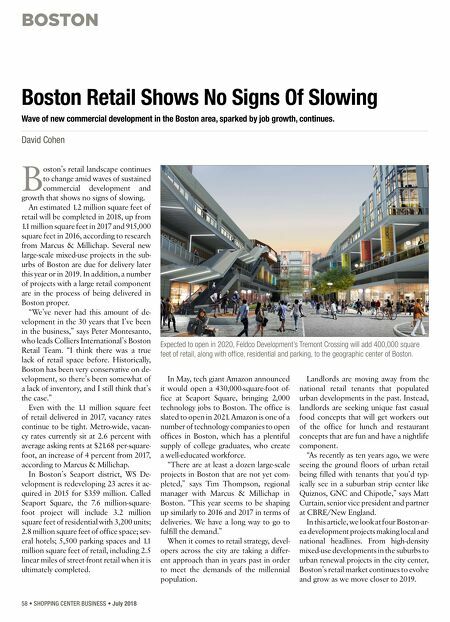 "Next to down- town crossing, Rox- bury used to be the biggest shopping dis- trict in Boston," says Greg Feldman, vice president of Feldco. "Part of our vision is to bring back a big commercial compo- nent to this part of town. There is a revi- talization going on in the area, but this proj- ect will be a spark for that transformation." MAYNARD MIXED- USE PROJECT MOVES FORWARD A 58-acre mixed-use project at the former research and develop- ment center for Digi- tal Equipment Corporation in Maynard is nearing completion. Maynard Crossing, a grocery-anchored project 25 miles west of Boston, will include 296,000 square feet of retail, entertainment and medical space and is expected to serve the nearby sub- The Township of Voorhees, 2400 Voorhees Town Center, Voorhees, Camden County, State of New Jersey is seeking qualified developers for the Voorhees Town Center The Redevelopment Area that has been designated is the former Echelon Mall now known as the Voorhees Town Center. Interested developers should contact: Mario DiNatale, Director of Community & Economic Development Voorhees Township, 2400 Voorhees Town Center, Voorhees, NJ 08043 856-882-5263 mdinatale@voorheesnj.com The project: Voorhees Town Center Redevelopment Area - Phase 2 consisting of the current Mall (350,000 sq feet), the former Macy's building (240,000 sq. feet) and a 5 acre lot. Current specifications and information may be obtained from Mario DiNatale during regular business hours (8:30 a.m.- 4:30 p.m.) or by emailing mdinatale@voorheesnj.com or by calling: 856-882-5263 For any questions regarding this project please contact Mario DiNatale. Roche Bros. Market will open a 32,000-square-foot location at the newly renamed Arsenal Yards in Boston's Watertown neighborhood.